You might notice a cluttered roof or two throughout your community but when one of these roofs is yours, you had better not hesitate to get it cleared away. The longer that clutter is allowed to sit along the surface of your roof, the more damage it can cause. 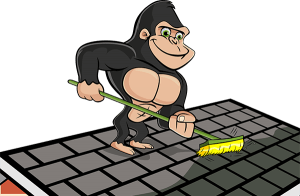 Instead of letting debris affect the condition of your home or business, call a Gorilla for your Wetaskiwin roof cleaning and moss removal. One of the greatest issues that arise with a cluttered roof is the lack of a view underneath. Sure, roof clutter looks poorly from the street but far more than curb appeal, clutter can lead to damage. While organic debris blankets your roof, you are unable to see exactly what it happening underneath this layer. This is where invasive growth begins and spreads secretly. It is in this layer that the structural integrity of your roof gets to be questionable. Instead of fussing with ladders and slippery surfaces, call a Gorilla for your Wetaskiwin roof cleaning and moss removal. If you happen to have moss growing along the surface of your roof, there is only one way to get rid of it: a Gorilla. There are plenty of theories as to how you can get rid of moss growth but these can cause more trouble than they are worth. Unlike moss and algae growth around your sidewalk, you cannot pressure wash moss away. Moss sits along the surface of your roof but it moves quickly. These plants weave their way around and under shingles and holds moisture against the decking underneath. Scraping away at moss after it has softened the surrounding materials pulls away coatings and can even create holes in building materials. Instead of leaving your home out in the cold, let our Gorilla help preserve the condition of your property with our Wetaskiwin roof cleaning and moss removal.